The TuBAR is easy to identify because of the visible pins arranged in two rows of four in the center of the plug. The TuBAR is commonly mistaken for an oddly arranged tubular pin-tumbler lock. The TuBAR uses eight pins arranged in two rows of four down the vertical length of the keyway. Each pin has a tapered end surrounded by a spring at the bottom of the pin chamber. Two sidebars are used at 3 and 9 o'clock in the plug, and each set of four pins uses a different sidebar. 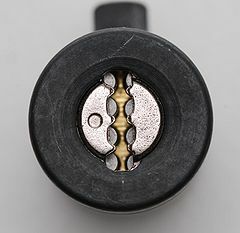 When the correct key is used, each pin is moved so that it's true gate is lined up with the sidebar, allowing the sidebar to retract and the plug to rotate. The sidebar is a two piece assembly of a bar and a crescent. The flat part of the crescent enters the gates on the pins while the bar restricts plug movement until the sidebar is retracted. There are seven positions for true gates, at 0.025" increments between 0.175" and 0.325" from the tip of the pin. Each pin has one or more false gates which are too shallow to allow the sidebar to retract. The false gates provide resistance to lockpicking attacks. The high spring tension on pins pushes each sidebar into the cylinder walls; the sidebars have no independent spring mechanism. Above the plug a profiling cap is used to make sure the key is inserted properly. The TuBAR is warded so that the key can only be inserted in one orientation. The profile cap is free-spinning and helps provide resistance to drilling attacks, too. When the plug is rotated the key is held in place by a protrusion that goes through a hole in the blade. TuBAR plug and one sidebar. Closeup of false and true gates on each pin. True gates of each pin properly aligned. The cylinder is sintered steel, and the plug brass. The pins, sidebar components, and profile cap are made of hardened steel. The key is made of steel with a plastic bow. The TuBar is relatively easy to disassemble. Tap out and remove the retaining rod at the rear of the cylinder. Push the plug and profile cap out of the cylinder. Visual decoding of the true gates of deep-setting pins can be done with the naked eye. Pins used in the TuBAR. The TuBAR plug with sidebars and profile cap. Pins in the plug, note the false gates.